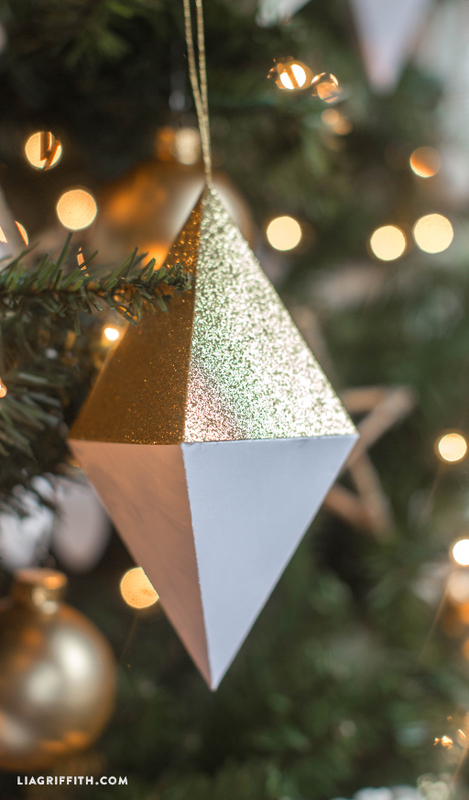 This week we are sharing all the patterns and tutorials for the handmade Christmas tree decorations that we created as part of the Michaels Dream Tree Challenge. 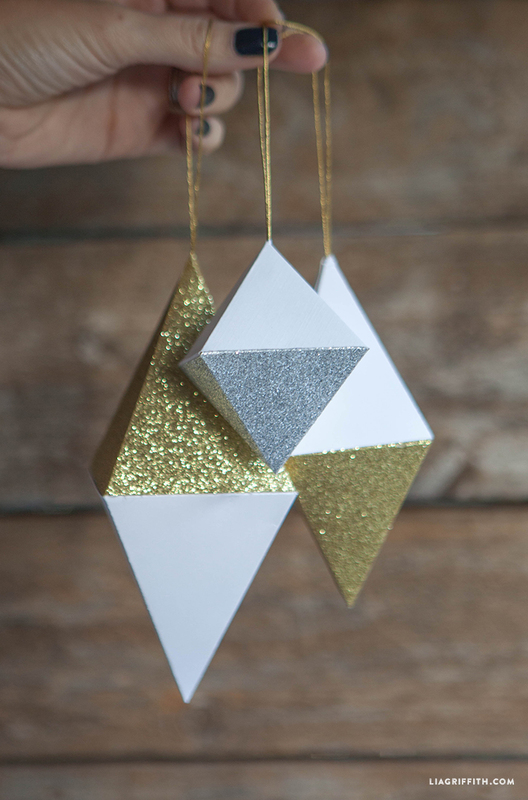 Today you can get your festive mitts on the patterns for our paper geode ornaments in a sparkling palette of glitter gold, silver, black, white and cream. We are including the patterns for four different sizes of geode and you can mix and match your papers to suit your Christmas tree theme. 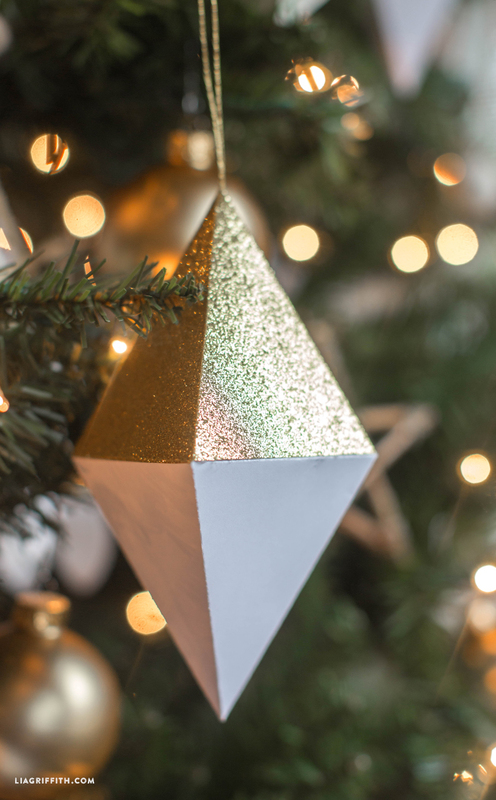 What I love about these handmade ornaments is that they look a million dollars yet can be made with paper that you most likely have in your craft stash! As long as your paper is around 80lb weight, your geodes are going to look gorgeous. 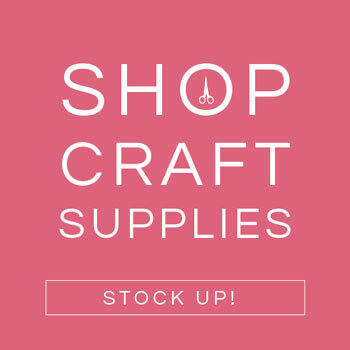 If you have a cutting machine simply click on the SVG file below. If you will be cutting by hand then download the PDF then print that onto your paper before trimming to size. Score along the lines and fold the tabs. 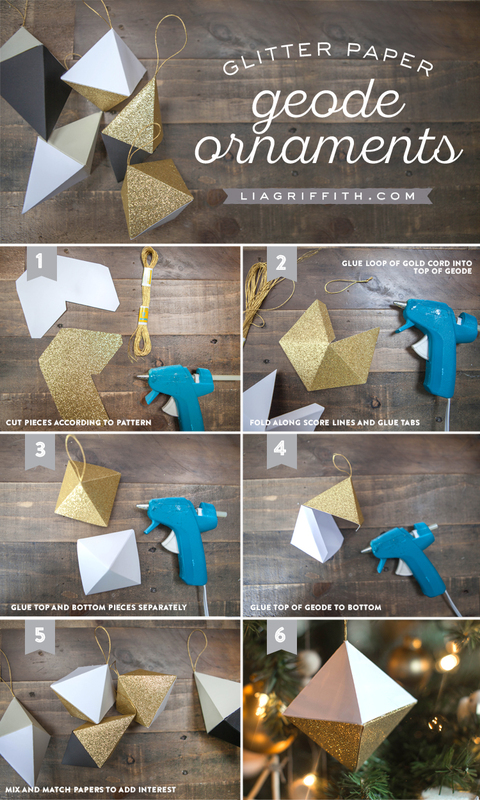 Add a loop of glitter thread to the top part before gluing it all together and your handmade paper geodes are ready to hang. Thank you so much for your sweet words, we are so glad you are enjoying your membership!! Good question–you can resize the template that we provided on the Cricut to make any size you want. Good luck! Thanks Lia! Unfortunately I am one of those “Cricut-less” individuals. I thought perhaps pages were missing when I loaded the PDF. Not a problem, I will take them to Staples and re-size them on the photocopier. Keep up the gorgeous work! 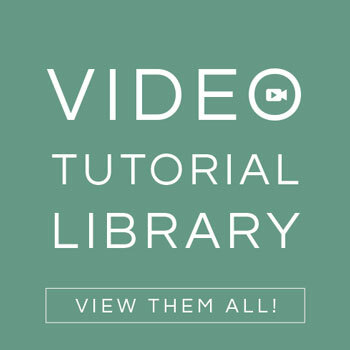 Lia Hi, I’m trying to do dowload their tutorials, pdf files, but I can not because it gives error in my log. I guess I forgot. How can I do it again? Really beautiful but the name is confusing. Geodes are the round hollow rocks with crystals inside them (they look like sparkly little caves). These do look like crystals, but not like geodes. Maybe you were thinking geodesic? So pretty. I always love your aesthetic and all the rustic felt projects with their such fun autumnal colors has been so inspiring. 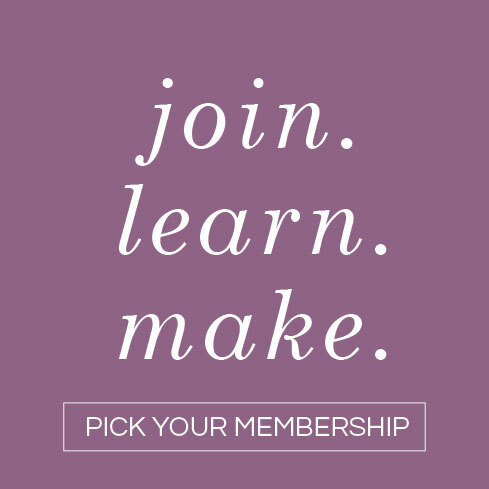 To then be thrown for a loop by how amazing these geode with the glitter are….I am so thrilled that I bought the membership. You have so many inspiring things to share. FYI-I have looked for good felt forever and literally bought the membership hoping to read what your source was. I finally found your source and low and behold she is right over by my sister’s house. I have literally been looking for 2 years and been very frustrated because it is so hard to know what you are getting when you Google “wool felt”. So thank you for finally leading me to some gorgeous GORGEOUS felt. Thank you SO much for these kind words, we are thrilled to hear this from you Danee!!! 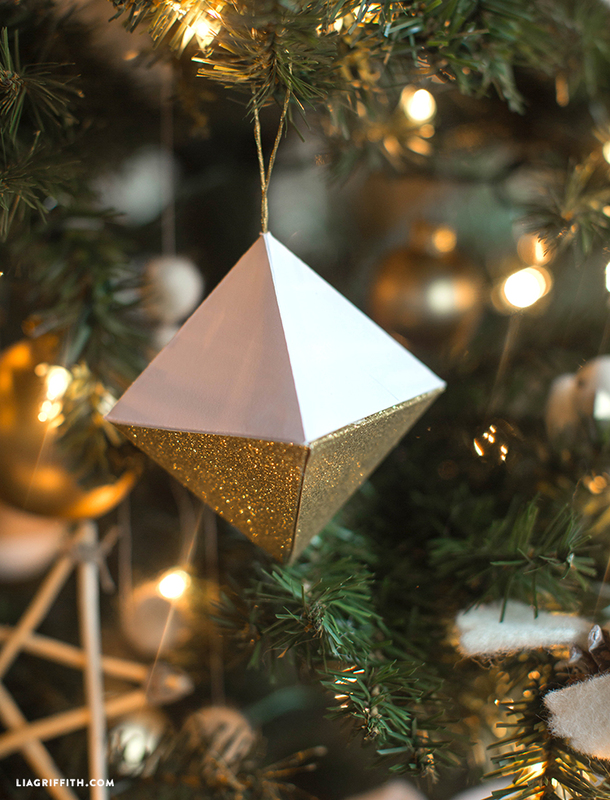 We have been in full holiday-mode here at the studio and the geode ornaments has been one of our favorite projects so far 🙂 Simple, but such a beautiful addition to make your tree really POP. And thank you for your comment on our felt, we love our felt projects and we are so glad you feel the same way! Looking forward to hearing more feedback from you on our upcoming projects 🙂 Enjoy! 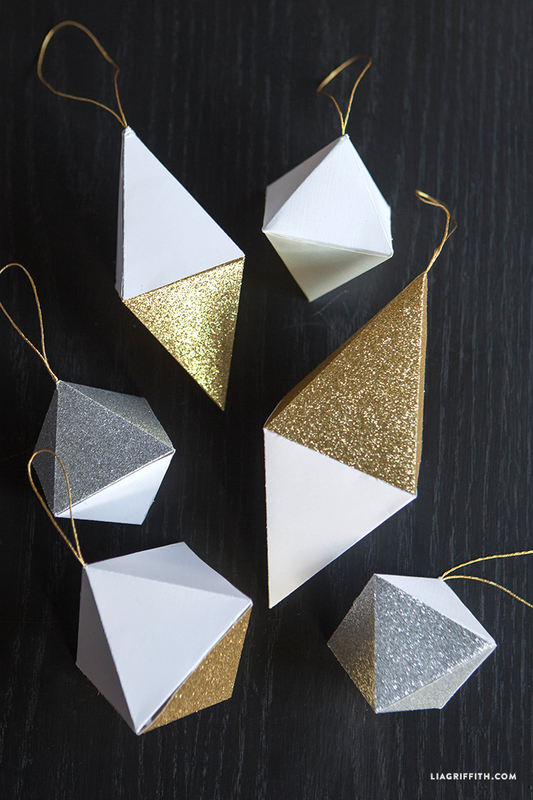 OH these are so wonderful, can hardly wait to make them. Looks like maybe should have ordered more of gold and copper paper and some silver. Shucks. Can order more tho, think had better as these are something I’ll love making for gifts as well as for our tree.